Dryness around the eyes can be due to climate, harsh chemicals, etc. First identify the cause, then treat it with the most effective remedies. The skin surrounding the eyes is incredibly delicate, which means dryness around eyes can lead to irritation and redness. This dry skin under eyes can take place for a large number of reasons with just as many treatment options. The condition can be anywhere from mild to severe and that determines whether simple solutions will work or you need to rely on stronger medical treatments. By learning about the causes, you can figure out the best ways to eliminate the issue. What Causes Dry Skin Around Eyes? Many things can lead to dryness around eyes, including the skin issues itself and the environment. Sunburn: Any overexposure (or even exposure) to the sun's UV rays may cause minor to serious burns to the skin of your eyes. You can also have dry skin near eyes if you are exposed to a welder's arc or sunlamp. Blepharitis: This condition causes your eyelids to inflame with scaly, dry skin. It can be triggered by facial rosacea, seborrheic dermatitis or bacterial infections. Perioral Dermatitis: This serious condition typically affects adult women and may spread to your mouth and nose areas. It is a skin rash that is usually due to poor hygiene. Atopic Dermatitis or Eczema: This may affect the area around the eyes like the eyelids. Eczema may lead to scaly skin as well as dryness. Dry skin around eyes may also be due to climate, with both humid and hot weather being major culprits. In addition, any extreme weather conditions or sudden changes to it may aggravate your skin's dryness, making it worse. Stress to the skin surrounding the eyes may also lead to dryness. This can be due to excessively rubbing the skin or wearing and applying make-up. Some examples of ways to stress the skin by the eyes would be using dirty makeup brushes with accumulated bacteria, wearing mascara and/or eyeliner, or applying concealer so you can hide dark skin underneath your eyes. Being exposed to harsh chemicals may also cause dry skin near eyes. Because this skin is thinner and more sensitive, it is naturally susceptible to this type of irritation from toxins and chemicals, including skin products and facial cleansers. Due to the delicate skin surrounding your eyes, gentle and natural remedies should be your first options to relieve dry skin. First, it can avoid worsening the problem; second, it can save your money spending on drug-based treatments which can be expensive and even lead to side effects. To some extent, the natural remedies you use to treat dryness around eyes will depend on the cause. Caused by Eczema: You can try topical solutions such as bathing with epsom salts, applying sea/salt water as a spray, or using organic coconut oil. You can also eat foods with high quantities of probiotics or gelatin as probiotics boost good bacteria which may heal the dryness. You can apply plain yogurt as a topical treatment or increase your yogurt intake, also eat foods with potassium like kimchi, miso, buttermilk, cottage cheese, kombucha, and kefir. Caused by Perioral Dermatitis: Avoid scented facial cleansers or soaps that may irritate the skin. Use pure warm water to wash your face and temporarily stop wearing make-up, at least that by your eyes. 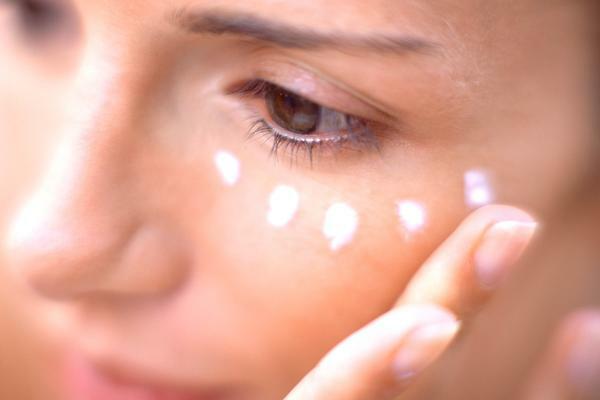 You should also stop using any face cream and opt for a gel or liquid sunscreen as opposed to gels. Caused by Blepharitis: To naturally eliminate this cause of dry skin around eyes, apply a warm compress to the eyelids or apply marigold/calendula topically. You should also try eating foods that are naturally anti-inflammatory, such as omega-3 fatty acids, ginger, and turmeric. Also try applying tea tree oil, coconut oil, or castor oil topically. Caused by Sunburn: Your ideal treatment for this is to prevent it from recurring. Try not to go outside between 10 and 4 as the sun will be strongest then. Also wear sunscreen and protective glasses. You can also apply aloe vera, milk, or an oatmeal compress, or take a cool bath. Cucumber Juice: Use a cotton ball to apply cucumber juice. Leave it on for between 5 and 10 minutes and then wash it off using warm water. Pat the area dry and use a quality moisturizer. Honey: Apply a bit of honey around the eyes. Leave it there for 10 minutes before washing it off. Avoid tugging or rubbing too much as honey is sticky and your skin around your eyes is very delicate. Olive Oil: You can apply olive oil topically to your dry skin and leave it there overnight. This method helps as the oil is known for its repairing properties as well as its usefulness as an anti-aging agent, taking care of fine lines. Tea Bag: Take a bag of green tea and dip it in cold water before resting it on top of your eyes. This not only soothes dryness, but also prevents wrinkle formation and boosts cell regeneration due to its abilities as a repairing agent. Raw Milk: Simply apply raw milk underneath your eyes. Leave it on for a little bit before using water to wash it off. Rose Water: Use natural rose water by applying it topically around your eyes. The water hydrates the skin and prevents puffy eyes. It is also a coolant and toner and will even reduce the size of your pores. Minimize Makeup: Be very careful with makeup use around your eyes, only using it if you have to. When you do use eye makeup, read the ingredients and rely on a quality makeup remover to take the makeup before bed. Leaving it on overnight will harm your skin and promote acne. Sleep Habits: Getting enough sleep ensures that your body has enough time to repair your dry eyes. Aim for seven hours a night and opt for silk cases to reduce friction against your face. Facial psoriasis can use topical antibiotics, but you may need steroid medication that is specifically designed for the eye areas due to their sensitive nature. Eczema will typically be treated using over-the-counter moisturizers and lotions, but you may also need oral or topical steroids.It can also be treated with lotions and gels containing antihistamine, antifungal, antibiotic, antibacterial, anti-inflammatory, or anesthetic medications. Blepharitis treatment can include steroid ointments and antibiotics. You can also find specific lotions and creams to moisturize dry skin by the eyes. Always remember that dryness around eyes may also indicate a serious condition. Pay attention to whether the dryness becomes chronic or the skin gets excessively dry, and visit your doctor in either situation. If you don't treat it, the dry skin may get significantly worse, so always take care of it as soon as you can.